Scotland-wide free bus travel for older (60 plus) and disabled people - often called your bus pass. The travel concessions eligibility criteria page provides more information on who is eligible. Additionally, for Dundee residents; if you are profoundly or severely deaf a letter from North East Sensory Services is acceptable; if you had a visual impairment, please inform us when you apply and we can check it with North East Sensory Services. 16 to 18 year old NEC holders are eligible for discounts on trains and buses and 50% discount on a rail season ticket. Full details are available here. Use your card in your local library. Simply let the library staff know that you now have a Dundee NEC they will do the rest. No need for additional forms to complete. Your NEC can be your Library card. You can be signed up automatically with no additional form-filling. Your leisureactive membership is also added to your Dundee NEC. See here for further details and an application form. Leisure concessions memberships are also available and are delivered on the same card. All Dundee City Council's secondary schools issue the Dundee NEC for cashless catering. KIDZ Cards are issued to all primary school children. This comes with library membership and instant access to discounts and concessions at Leisure and Culture Dundee Swimming Centres. 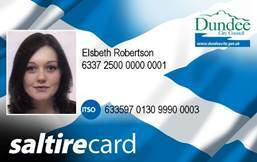 More information on the National Entitlement Card across Scotland is available here.